The STN1170 Preorder has completed. If you would like to order a reader, please see the STN1170 OBDII Reader page instead. The time has come to try a Kickstarter type of project for the STN1170 OBDII Module ($1040 raised so far)! Unfortunately I cannot do an official Kickstarter project as they don’t allow automotive projects. Anyway, I have a design ready for production that has been tested by myself and a customer who has access to newer vehicles w/ the MSCAN and SWCAN interfaces in them. I just need the funds to make this happen! Essentially I do not have funds to do an official production run of this unit. Over the past year, I’ve built nearly 100 STN1110 by hand, and with the added complexity of the STN1170 module, I can’t afford the time to hand assemble them, thus resulting in the need for paying for assembly. Shown in the pic above is the fully working STN1170 Bluetooth OBDII Reader prototype. This definitely isn’t vaporware; it is a real project just waiting for funds to make a bunch of them. Option 1 (expired): This option is just a “donate money to the cause” button. Donations of this type do not have a limit as to how many are available. Donating any of the three amounts ($20, $40, $60) will get you a big, awesome thank you from me (woohoo!) and PDF versions of the schematics and gerbers of the STN1170 module emailed to you (provide a real email address please). I have yet to decide whether or not to open source the design, but regardless of this, the design files wouldn’t be posted until probably June or so 2013. This donation option is really just a “thanks for providing the STN1110 design free of charge and support for the design”. Amounts over $20 don’t result in receiving anything additional to the $20 donation. This donation is not refundable once the PDFs are emailed to you. Option 2 (expired): This is an option for you to preorder one of the STN1170 Bluetooth OBDII Readers from the first production run that this fundraiser will fund directly. There are 20 donations of this type available. Purchasing this option guarantees you one of the first 20 units back from production. If you would like multiple units, purchase multiples at the full price and I’ll refund the excess shipping (shipping refund applies to non-USA countries ONLY). You will also receive the same PDFs as Option 1 above. This option is partially/fully refundable if the deadline outlined below is NOT met. In the event that the deadline is not met, you will be refunded your donation amount minus $20 (if PDFs have been provided). Please specify “no PDFs” or something to that effect in the checkout note if you would like to maintain the ability to receive a full refund of your donation (no schematic/layout PDFs provided). Option 3 (sold out): This option is the full-featured donation. Selecting this option gets you a STN1110 OBDII Bluetooth Reader along with items from Options 1 and 2. USA orders will have the STN1110 and STN1170 modules shipped separately, unless you’d rather they shipped together when the STN1170 module comes back from assembly. Non-USA orders have the option of combining shipping or an additional cost option for shipping individually (since shipping internationally costs me $24 a shipment). This option is fully/partially refundable depending on what items have already been provided to you. In the event that the deadline is not met, your money will be refunded as follows: Full refund if you combine shipping of the STN1110 and STN1170 and request no PDFs of schematics/layout (make a note in checkout), partial refund of the donation amount minus $20 if you wanted combined shipping and PDFs were provided to you, partial refund of donation amount minus shipping and full price ($90) of the STN1110 module if PDFs not provided and STN1110 module shipped, or no refund if STN1110 module has shipped and PDFs were provided to you. Deadlines: Option 1 will expire once units are received back from production (end of April 2013 at the latest). Options 2 and 3 have a deadline of reaching $1200 (total of Options 1, 2 and 3) by March 10, 2013. Once $1200 is reached, refunds will not be given. Options 2 and 3 expire when they run out of available donations, or when March 11th comes around. If $1200 is not reached by March 10th, full refunds will be give on March 11th for any items that have not been provided electronically or physically. In general, this Kickstarter-esq fundraiser is safer than Kickstarter is in the sense that refunds are available depending on options chosen. Regardless, this money goes fully to the development of the OBDII Modules and not for other things. Paypal is being used so that refunds are easy to make to you. You must understand that once something is provided to you, the cost of that item is not refundable. I’ve enjoyed interacting with the various people that have purchased my STN1110 units over the past 1 and a half years, and I hope to continue this with the STN1170. Above all, have fun with the readers and the information you can access from your vehicle! What’s the difference between the STN1170 based Bluetooth OBDII Reader and the STN1110 based OBDII Reader that’s already available? The STN1170 chip and associated circuitry allows you to access Ford’s MSCAN infotainment interface and GM’s SWCAN infotainment interface along with all the other interfaces the STN1110 can access. The STN1170 based reader is lower power (standby) than the STN1110 based module, is a few millimeter shorter than the already tiny STN1110 module, and is much smaller than the OBDLink MX. Will the STN11170 module have an enclosure? No, not at the release of the product anyway. This is a hobbyist type of device, but could be used in your product as not having an enclosure allows the STN1170 module to fit in spaces the OBDLink MX can only dream of. The module is so short and unobtrusive that you’ll most likely forget it’s installed. At some point in the future, an enclosure may be designed for the unit, but production costs for an enclosure are quite steep for a hobby project. What happens to the STN1110 Bluetooth OBDII Reader when the STN1170 Bluetooth OBDII Reader comes out? The STN1110 will likely be discontinued in favor of the STN1170 as it can access more interfaces than the STN1170. I would like to keep the STN1110 module going, but at this point, funds aren’t available to support production of two different units. The final price of the STN1170 unit will be the same or more likely, a little lower than the STN1110 module is now. How does the STN1170 compare with the OBDLink MX? The features are largely the same. The STN1170 based module will be cheaper than the OBDLink MX, although it cannot read vehicle information as quickly as the OBDLink MX can. Read performance is equal or slightly better than the STN1110 unit I have for sale now. Power comparisons have not been made, but the STN1170 based module has to potential to have lower power consumption (in standby) than the OBDLink MX and my current STN1110 module. Pairing to the STN1170 doesn’t involve any button presses like the OBDLink MX and can offer similar protection from unwanted pairings provided you set a good pairing password. The STN1170 module is much smaller than the OBDLink MX, and doesn’t present a light show in your vehicle at night when the module is active like the OBDLink MX. The STN1170 (along with the STN1110) module is easily firmware upgradable, just like the OBDLink MX. Bluetooth range will be lower compared with the OBDLink MX, but ranges in excess of 30 feet are possible with the STN1170 (and STN1110) module. An option may be available to use a Class 1 Bluetooth radio (RN-41) instead of the Class 2 radio (RN-42) to increase the usable range. Will the units look like the one in the picture above? For the most part, yes. 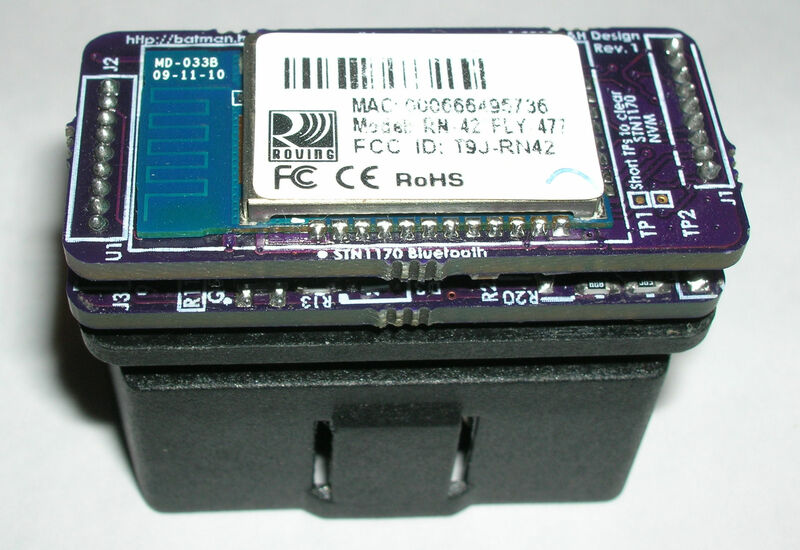 The Bluetooth module will be on the top, two double-sided assembly boards in the middle, and the OBDII connector on the bottom of the stack. The PCBs themselves will be black with red silk screen instead of the purple/white combination you see in the picture above. Still have questions? Post a comment at the bottom of this page and I’ll get back to you ASAP. Don’t worry, your comment doesn’t show up unless I approve it to show up. You’ll need to provide a valid email address in order for me to get in contact with you though. No need to post this comment. Just try and contact me by email. 1) At all times it will grab trip kilometers and store it (basically you now have a second odometer). When a phone is in reach, then the application that I built will grab this information every time your car starts. So now you have an automatic sync for your kilometers to your car. This will help out with automatic maintenance notifications. 2) Whenever there is a check engine light, you should be able to read the PID and see what the code is. If needed you should be able to clear it too. I would prefer to use BLE, so I can use it on an iPhone too. Would you be able to customize something for me? At the moment I’m quite busy w/ life and other side jobs. I may be able to help in the future, but not at this time. Is there a way I can log everything or display the info on android/IOS or PC once your device is plugged in? I want to see what command is causing my ECU to to have issues. Yes, you can set your protocol w/ the ATSPx command (replace ‘x’ w/ the protocol number you desire to use), then do “ATMA” (actively listens to all traffic) and use a terminal program on the PC (or android I suppose) that supports logging. I believe teraterm and putty on the PC support logging. The only gotcha w/ the ATMA command is that if you’re monitoring a busy CAN bus, you’ll likely overflow the buffer on the STN1170 since the Bluetooth interface probably won’t be able to keep up w/ the amount of traffic on a 500kbit/sec CAN bus. You’ll need to set up filters to just get the messages you want to see (see STN11xx family reference manual or ELM327 reference manual).